Pokemon GO uses less mobile network data per day than Facebook, Instagram, and Snapchat. Pokemon GO, by Niantic Inc., has taken the mobile gaming world by storm. Even though Pokemon Go is used almost three times as much on wireless networks, compared to the most popular social networking apps that are used more on WiFi, it still uses less than 1/3 of the costly mobile data that Facebook, Instagram and Snapchat consume. According to data from the AppQuest.io CrowdSource Community—where millions of global consumers anonymously donate real-time app usage and performance data on more than 6 million app versions—Pokemon GO’s social-app-like constant usage does not drain massive amounts of mobile data as people believe. Pokemon GO users are utilizing 70.05% of data usage for Pokemon GO over carrier networks, putting it at the top compared to Instagram (25.71%), Facebook (24.86%), and Snapchat (22.65%). Seeing how much data usage Pokemon GO consumes over mobile may be daunting, but this simply illustrates that Pokemon GO is used more so over mobile than Wi-Fi networks. 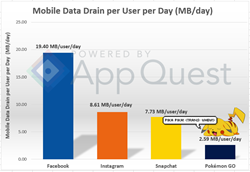 Even though Pokemon GO uses data more-so over mobile networks than Facebook, Snapchat, and Instagram, you’ll be surprised to learn that it isn’t a massive mobile data drainer as you may have thought. On average, users drain 19.40 MB/user/day on Facebook, 8.61 MB/user/day on Instagram, and 7.73 MB/user/day on Snapchat. Pokemon GO consumes much less mobile data than Facebook, Instagram, and Snapchat, clocking in at 2.60 MB of mobile data per user per day. If you’re an avid user of either Facebook, Instagram, Snapchat (or all three), and never once was worried about your data drain, Pokemon GO won’t, and shouldn’t be an issue. *Data collected are based on anonymized Android data contributed to the App Quest community.